If you charter a yacht in the Ionian Sea you will enjoy the most tranquil sailing in Greece, with safe anchorages in bays surrounded by green olive and pine trees. The NW wind, the Maistro, starts blowing around noon, fades away by sunset and its force is almost always moderate up to 5 Beauforts. 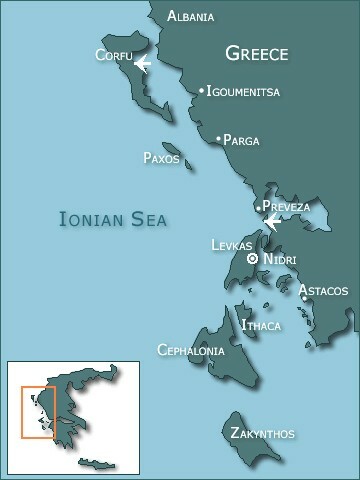 The Ionian islands are reached by ship from Italy, either to Patras or Corfu and by plane from Athens. Furthermore there are direct flights from several European airports to Corfu, Cefallonia and Lefkas. The most famous sites to visit in the Ionian Sea are Corfu, Paxi and Antipaxi, Fiscardo in Cefallonia, Kioni and Vathi in Ithaca and Zakynthos with its magic caves. You may also visit the small islands of Meganissi, Kastos and Kalamos and of course Syvota and Parga in the mainland coast. Suggested itinerary for one-week charter from Corfu: Corfu, Parga, Vassiliki, Meganissi, Fiskardo, Paxi, Corfu. Suggested itinerary for two-week charter from Corfu: Corfu, Parga, Vassiliki, Fiskardo, Vathi, Zante, Kioni, Agia Efimia, Sivota, Paxi, Antipaxi, Corfu. Suggested itinerary for one-week charter from Lefkas: Lefkas, Fiskardo, Vathi, Kioni, Kalamos, Meganissi, Lefkas. Suggested itinerary for two week-charter from Lefkas: Lefkas, Vassiliki, Fiskardo, Agia Efimia, Zante, Vathi, Kioni, Frikes, Meganissi, Kastos, Astakos, Kalamos, Lefkas.